What is the difference between growth and dividend option? Growth option gives you the choice of reinvesting your profits in the mutual funds. This practice is very beneficial if you are looking forward to accumulating wealth by making long-term investments. As a mutual fund investor, you might have often come across the growth and the dividend pay-out options. Each has their own pros and cons. Depending on your goal and duration of investment, you can choose the one that suits you best. But how do you make this choice? Is it based on popular demand? Is it based on your gut feeling? Is it based on someone else’s advice or experience? Or have you really consciously put thought behind it before choosing one? If your answer is yes for any of the reasons above except the last one, its high time you reconsider it. It is essential that you understand the difference between the two and make an informed choice. 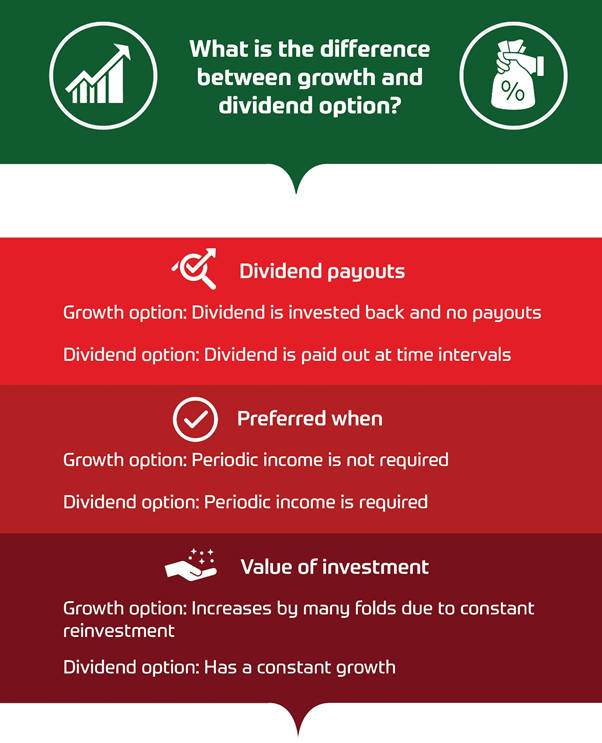 Here’s a quick guide that would help you know the between growth and dividend options in a simple way. Growth option gives you the choice of reinvesting your profits in the mutual funds. This practice is very beneficial if you are looking forward to accumulating wealth by making long-term investments. The reinvestment brings in the power of compounding, where the Net Asset Value of the investment increases by many folds due to constant reinvestment. It pays off well especially when investment is made for longer terms in well-performing funds. Dividend option ensures a fixed income at regular intervals, which are paid off in the form of dividends by the fund managers. It is the profit made by the fund, which is paid off to investors at regular intervals. While investors have the choice to utilize the funds by investing it into some other fund or invest in the same fund by buying more units of fund shares, instead of spending it. Dividend option is ideal for retired persons and people who are seeking a fixed income at regular intervals. To ensure that the dividend paid-off is significant enough it is important that you invest a large amount in the funds. Here’s the difference between growth and dividend option that could be helpful to you in choosing what to do with your mutual fund. Growth option: Profit of the fund is reinvested in the fund to buy more shares and not paid out as the dividend. Dividend option: Profit of the fund is paid out at regular intervals in the form of dividends to the investors. Growth option: Growth option is preferred when the investor is looking forward to accumulating wealth and gain higher returns from the long-term investments. Asset value appreciation remains the priority when growth option is preferred. Dividend option: Dividend option is preferred when the investor is looking forward to getting a regular income at fixed time intervals. Here, asset value appreciation is not the priority but a regular income is. Growth option: The Net Asset Value (NAV) of investment increases by many folds with time. It is due to constant reinvestment of the profits gained over the time that the fund keeps on buying more shares, which increases its NAV. It is more like the power of compounding, which contributes to the asset value appreciation. Dividend option: In dividend option, the profit of the investment is paid as a dividend, which results in a lower asset value appreciation. Since the profit pay-out again lowers the NAV of the fund, the final asset appreciation upon maturity is lower as compared to the growth option. Growth option: Since the growth investment is about reinvesting profit, even a small amount turns out to give a good return if kept for a longer duration with the growth option. A long tenure is a key to get better returns in mutual funds with growth option. Dividend option: In dividend option, to ensure that the dividend paid is a significant amount, a high amount of investment is required. Though a long-term investment always pays out well, it is not necessary to make long-term investment always for dividend option in mutual funds. A high amount of investment is a key to get better returns in mutual funds with dividend option. By understanding the difference between growth and dividend options, deciding which one to choose would become a lot easier for you.